Combining the magic of Disney with the artistry of Heartwood Creek gives you the magic of Disney motion pictures. Let Cogsworth bring the magic of Christmas into your home. Designed by award winning artist and sculptor, Jim Shore for the Disney Traditions brand. The hanging ornament is made from resin. Unique variations should be expected as this product is hand painted. Packed in a branded gift box. Not a toy or children's product. Intended for adults only. 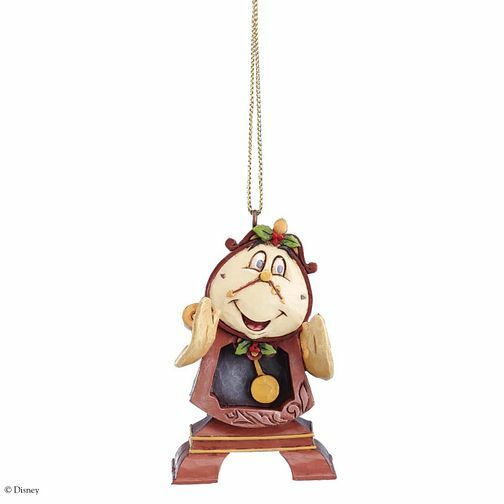 Disney Traditions Cogsworth Hanging Ornament is rated 5.0 out of 5 by 2. Rated 5 out of 5 by Anonymous from Daughter in law will love it... Beautiful ornament, will look perfect on the tree. Rated 5 out of 5 by Anonymous from Beautiful I’m very pleased with my purchase and I would recommend this hanging ornament.